For all those vinyl maniacs around, here's at last the vinyl version of the brilliant BULLETS debut album with way cool alternate artwork! THE BULLETS with their first official album come to make a noise in the rock 'n' roll scene internationally! Being involved in rock 'n' roll culture for many many years, they amazingly manage to capture all its sub-genres such as Teddy Boy Rock, Neo-Rockabilly, Surf, Doo-Wop, Desperate Rock 'n' Roll. It is about quite an ambitious effort and one of the most important ON STAGE RECORDS releases so far! Everything on this album seems to be perfect! Starting out with the well-done double "gatefold" digipak cover of awesome artwork, lyrics, credits and cool band photos. Trying the stuff inside you will surely dig the band's superb originals of good clean guitar riffs and sublime vocals, such as the self-titled "Final Race", along with "I'm Sorry", "Ramblin' Gal", "You Treat Me Badly", "Daniela", "Don't Pass Me By", "I Don't Know", "Holiday Memories", "I Wanna Be Alone" and "Pulsar". Throughout the above tracks one can also recall the spirit of "King" Elvis, "Killer" Jerry Lee, the "craze" of Stray Cats as well as female groups of the past when vocals are becoming truly attractive with the contribution of band's close friends, Claire and Mary which could have been daughters of the fabulous Ronettes!!! Four great cover-versions are included here like "Little Sister" (Doc Pomus & Mort Shuman), "One Cup Of Coffee (And A Cigarette)" (Glen Glenn), "Baby Blue" (Gene Vincent) and "She's Wicked" (Fuzztones), paying this way tribute to the legends of the past. Especially with the last one, THE BULLETS have managed to turn the Fuzztones' classic into a totally trash rock 'n' roll version, making Rudi Protrudi got astonished for good! Several session musicians of the Greek rock 'n' roll scene, mostly close friends of THE BULLETS, such as The Frantic Five, The Overtones, Blues Wire, Little Peter & The Bad News, Alexandros Perros & The Lone Stars, The Rockets, Dustbowl, Aroma Caribe, Breathless, Blues Mobile, Free Soul and more, are giving their best to the contribution of the album. Thessaloniki's leading analogue equipment studio of George Manios deserves recognition for the impeccable production of the album. 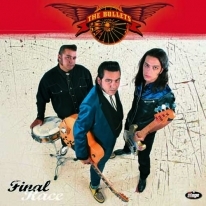 "Final Race" is Thee accomplished rock 'n' roll album which is not only destined to the aficionados of the past decades but to all the open-minded people with a taste in music! Limited to 500 copies!